Bruce Hornsby’s Halcyon Days was the invasion of the Brits! Bruce is joined by Elton John, Eric Clapton and Sting. It was Bruce’s sole release under the Columbia label. This record had the biggest gap between highest and lowest scoring tracks. The top voted songs did very well (Circus on the Moon, Gonna Be Some Change Mad) and the more comedic songs (What the Hell Happened, Heir Gordon) were around 30% behind. Musical collaborations (Elton John, Eric Clapton, Sting) scored very highly compared with earlier releases, and every aspect scored better than the previous release two years earlier, Big Swing Face. Thanks to all who voted! A big rise on the scores from Big Swing Face! 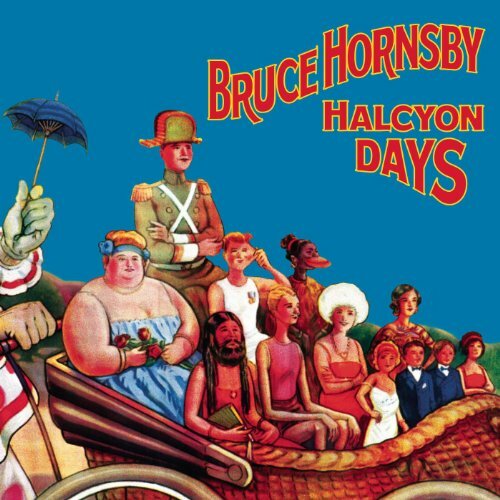 Bruce Hornsby’s latest album, “Halcyon Days,” literally offers something for every type of fan-except perhaps those who fell in love with Bruce’s very earliest records and crave a return to that type of sound. I think it’s safe to say that the days of “The Way It Is” and “Scenes from the Southside” are gone for good. However, in “Halcyon Days,” his eighth studio recording, listeners hear a welcome return to the piano that buttered his bread, so to speak, and was all but absent from his last album, “Big Swing Face.” The new record features 11 tracks whose musical genres range from a New Orleans-style Dixieland piano and vocal number (“Heir Gordon”) to a partially atonal piano song backed by a string section (“Song F”). The strings make a return visit during the beautifully retrospective “Hooray for Tom,” which features a charmingly winsome barbershop quartet-type piano sound. A couple of big names join Bruce for collaboration; Sting sings backup vocals on the techno-driven first track, “Gonna Be Some Changes Made,” and Sir Elton John makes an appearance on the ethereal “Dreamland.” Humor abounds on “What the Hell Happened,” a tune which features some virtuostic piano riffs and a clarinet and drum combo. “Circus on the Moon” is the perfect road-trip song with a steady up-tempo rhythm and examples of the two-handed independence that has become synonymous with Bruce. With its funky harmonies and driving bass line, “Candy Mountain Run” could have fit just as well on “Big Swing Face,”; however, piano is included in this offering. The album features a nice blend of snappy tunes such as “Mirror on the Wall” and “Lost in the Snow,” and slower, more introspective numbers such as the title track. “Halcyon Days” offers a nice balance between “Big Swing Face,” which left many fans scratching their heads, and Bruce’s first forays without The Range, when his trademark 80s sound began to permanently change. Listeners should appreciate a mix of thoughtful lyrics, myriad musical genres, and the much-desired return of the blacks and whites. 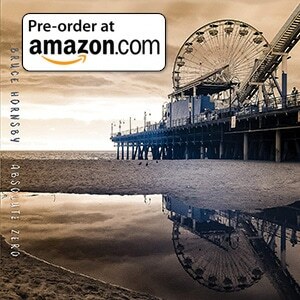 NEW YORK, June 1 /PRNewswire/ –– Three time Grammy-winner Bruce Hornsby has signed with Columbia Records, who will release the artist’s ninth full-length album, Halcyon Days, on Tuesday, August 10.Produced by Wayne Pooley (who first worked with Hornsby on 1993’s Harbor Lights) and Bruce Hornsby, Halcyon Days debuts 11 new songs written by Hornsby: “Gonna Be Some Changes Made” (the album’s first single), “Candy Mountain Run,” “Dreamland,” “Circus On The Moon,” “Halcyon Days,” “What The Hell Happened,” “Hooray For Tom,” “Heir Gordon,” “Mirror On The Wall,” “Song F,” and “Lost In The Snow.” Guest artists on Halcyon Days include Eric Clapton, Elton John, and Sting. Bruce Hornsby struck RIAA gold — and triple platinum! — with his debut album, The Way It Is, recorded with his band, the Range. His debut generated three Top 20 hits, including its #1 title track, and earned Bruce Hornsby & the Range the Best New Artist Grammy for 1986. Hornsby took home his second Grammy in 1989 for Best Bluegrass Recording for “Valley Road” (from the Nitty Gritty Dirt Band’s Will The Circle Be Unbroken, Volume II) and his third Grammy in 1993 for Best Pop Instrumental for “Barcelona Mona” (created with Branford Marsalis for the Barcelona Olympics). His eight albums — The Way It Is (1986), Scenes From The Southside (1988), A Night On The Town (1990), Harbor Lights (1993), Hot House (1995), 1998’s double CD Spirit Trail, his double live collection Here Come The Noisemakers (2000), and Big Swing Face (2002)–have sold more than 10 million copies worldwide. One of pop music’s most in-demand “side” men, Bruce Hornsby has played on more than 100 records with artists ranging from Bob Dylan, Don Henley, and the Grateful Dead to Bob Seger, Bonnie Raitt, Bela Fleck, and Willie Nelson, among many others. His songs have been performed and/or recorded by a variety of artists including Willie Nelson, Don Henley, Tupac Shakur, Bob Dylan, Chaka Khan, Robbie Robertson, Huey Lewis, Sara Evans, and Leon Russell. Bruce Hornsby became a part-time member of the Grateful Dead from September 1990 to March 1992, performing with the group on more than 100 concerts in America and Europe.